Employees with specific skills and a technical education are in demand in the transportation industry and this need is growing. Unfortunately, too few young people are being ushered toward transportation careers. Over the past decade, the nation’s K-12 educational systems have worked hard to deliver students to four-year degree programs at universities. This focus has greatly reduced the number of shop and hands-on technical classes, resulting in dwindling opportunities to expose students to the sorts of careers that drive the transportation industry today. The Minnesota State Transportation Center of Excellence is determined to reverse this trend by providing young people with in-person, hands-on experiences, while demonstrating the value to parents, school administrators, industry representatives, and others. They are doing this with a new mobile outreach unit, a trailer decked out with stations for each transportation mode that is pulled by a truck. The trailer is outfitted with several pieces of equipment, creating hands-on stations where students, counselors, teachers, peers, and parents can participate in real activities that occur in transportation careers. 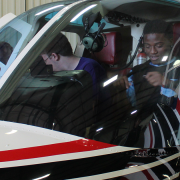 These activities showcase the technology in the industry and help students develop passion for transportation careers. “It’s one thing to put out a webinar, put out a newsletter, or tell someone about these careers,” said Chris Hadfield, Director of the Minnesota State Transportation Center of Excellence. But, he pointed out, it’s completely different when students and their parents visit the trailer and have that hands-on experience. The mobile unit was used for the first time in early May at an event where high school students were competing to build fuel efficient miniature cars with lawn mower engines. The event hosted about 700 attendees and approximately 200-300 people walked through the trailer. 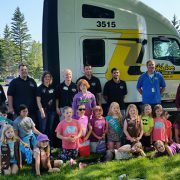 The Minnesota State Transportation Center of Excellence’s new mobile outreach unit is equipped with hands-on experiences representing each mode of transportation. Inside, the center has designed an experience that promotes engagement with not just the students. School decision makers and parents, which the center refers to as influencers, are also targeted by the trailer. “You have to have something to draw them in, the big trailer does that. Then you have to have industry partnerships,” said Hadfield. The goal is to have industry representatives from each transportation sector accompany the trailer at events. These industry volunteers work alongside center staff to greet people and talk about transportation jobs. “We know that when we put an industry person in front of a school superintendent while they’re seeing students get engaged with the experience, that’s when we start to have real conversations about bringing their tech programs back, bringing their transportation programs back, maybe doing some cool internship or apprenticeship with us,” said Hadfield. Involving industry representatives in outreach activities also serves to bring the transportation sectors together. “Our idea is to have somebody from the trucking industry sitting side by side, two feet away from, somebody from the aviation sector and they’re side by side with somebody from the railroad and so on and so forth. We have these people mingling and they hadn’t realized before that they have something in common and now they realize that they do. And, common denominators mean that you should be collaborating and working together. There’s a lot more power in working together than alone in silos,” sad Hadfield. Moving forward, the trailer will be made available to each of the center’s 26 partner post-secondary schools across the state. To utilize the trailer, the schools’ responsibilities include coordinating industry representatives to accompany the trailer, getting the high schools in their region on board, and arranging either a career fair on their own campus or to bring the trailer to a high school. The trailer is made available to center partners at no cost except to return the truck with a full tank of gas. Brand new, the trailer is already booked for over 36 events over the course of the year. The success of the project so far is attributed to the collaboration of the schools, employers, and the center. Having representatives from the industry is really important toward the outreach goals of the center. “If a post-secondary educator tells a secondary educator or a student about these careers, that’s nice and it works fine. But, when an industry person tells you, ‘By the way I’m hiring and right now I have people who work for me and this is what I pay them and this is what they do,’ the message has much more weight for a student, a parent or for a school superintendent,” said Hadfield. The Minnesota State Transportation Center of Excellence is an innovative collaboration between Minnesota state colleges and universities and industry partners dedicated to educating and training workers for high-demand careers in the transportation industry. The center was started in January of 2013 in response feedback from industry “listening sessions” held in 2012. 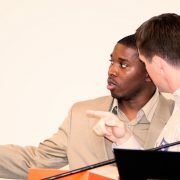 Through the development of partnerships, the center supports workforce alignment in order to meet the current and future needs of the state’s transportation industry, not only in terms of the number of graduates but also in terms of the location of programs and the rate of degree attainment. The center coordinates the alignment of skills and knowledge needed by employers with what is taught in instructional programs while providing outreach to improve student awareness of employment markets.